Each frame is .1 seconds apart. 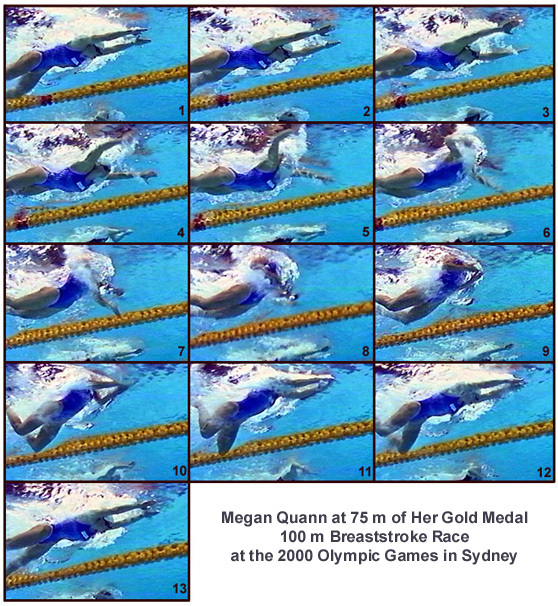 In this race, Megan Quann recorded a time of 1:07.05. Frame #1: The swimmer's arms, head, and body are streamlined. The head is down between the arms with the swimmer mainly looking down rather than forward. At this moment, the effective stage of the kick is completed. Although the legs are not straight, they are most likely beginning to decelerate before straightening. Frame #2: The legs straighten and cease backward movement but are angled slightly downward. The arms begin to part with the hands angled to produce some lift that will support the legs rising to an improved streamline position. Frame #3: The legs rise as they come together. The hands continue to spread with the shoulders elevated fully forward. That position facilitates keeping the hands well forward of the swimmer. The absence of any arm movement backward is notable. Frame #4: When the hands are approximately double-shoulder width apart, they rotate toward being vertical, the upper arms medially rotate, and the elbows begin to flex. This movement begins to create backward propulsion through the development of a drag force. The development of that force is rapid with the turbulence created by the hands being visible. Frame #5: Medial rotation of the upper arms is completed and adduction begins. Flexion at the elbows increases. The size of the drag-force turbulence pocket is quite large and now extends down the forearm. The actual force that is created is both down and backward. The vertical component is necessary so that the early lift of the head and shoulders can be supported without causing any other aspect of the swimmer to react downward. Frame #6: Both adduction and flexion have created a large propulsive force causing the swimmer to move forward noticeably. The shoulders and head movement is accommodated largely by hyperextension of the lower thoracic region of the spine. The remainder of the swimmer is still streamlined. Frame #7: Propulsive forces developed by the arms are completed. The large drag force pocket of turbulence obscures the right arm. The legs begin to bend at the knees preparatory to kicking. The swimmer's thighs remain streamlined demonstrating the benefit of a very flexible back. Frame #8: The hands have cut into the swimmer's centerline. Very little, if any, lift is created by this movement, that is, there is virtually no inward scull after the strong direct propulsive drag force developed by the arms. The legs begin to bend noticeably. Frame #9: The hands come together as inhalation is completed. The head and shoulders are at their highest position. The legs continue to draw up. Frame #10: The hands are pushed forward slicing the surface. The head and shoulders begin to return. The legs continue to draw up. In that movement, the knees do not drop very much. The swimmer's flexible lumbar region of the spine rotates the pelvis backward, which assists in keeping the thighs up. Frame #11: The hands continue to push forward close to the surface as the head and shoulders are thrust forward and down toward a streamlined position. The kick commences with the feet fully everted allowing force to be created from the beginning. Frame #12: The kick is in a most powerful position with the body and arms almost perfectly streamlined. The kick will be optimized in its effect because of the minimal resistance offered by the streamlined body, head, and arms. Frame #13: A position slightly later than that exhibited in frame #1 is achieved. Megan Quann demonstrates some of the latest trends in women's breaststroke swimming. Her kick begins with the feet fully turned outward. The kick is directly backward (no circular path or unnaturally narrow "wedge kick"). Flexibility in the upper back supports elevation of the shoulders and head without causing the hips or thighs to drop noticeably. Flexibility in the lower back allows the preparation for the kick to occur with the knees and thighs dropping very little. The pull does not comprise an outward-inward scull pattern. The outward actions of the arms create some lift that supports streamlining the legs, not propulsion. The pull is purely drag force production, somewhat like the early stage of a good butterfly stroke pull. After propulsion is completed, the hands cut inward rapidly and then proceed with a rapid forward stretch along the surface.